There is a glaring omission of Russian artistic tradition in Western classrooms. I believe there are a few immediate reasons for this vacancy, the most obvious being the political conflict which has long possessed our two countries. I’ve long believed that the study of Art History is just as useful as a degree in political science when it comes to understanding international relations. Art is created in the wake of schismatic socio-political events. Art expresses melodrama and history, and art also expresses societal value, priorities, and routine. This is why I find it absolutely mind boggling that so many American history and political science students slave over the daily agenda of Vladimir Putin, the economy of Moscow, the tension of the Cold War, and the Siege of Leningrad, but would be hard-pressed to name or have experienced the works of a major Russian painter or poet. I have taken courses about Western art, Eastern art, even courses which touch on Middle Eastern and Baltic art history. The geography of Russia touches all of these regions, yet I’ve not once seen a single slide in an art history departmental course of Russian origin. Russian religious icons and manuscripts are no less critical or beautiful than their French and German counterparts. The paintings and sculptures of Russian artists are meticulously preserved. So valuable are these artifacts to the approximate 196 million ethnic Russians worldwide that, without food and in the face of death, the city of Leningrad buried their treasures in the frozen ground, rather than surrender cultural riches to the Germans. 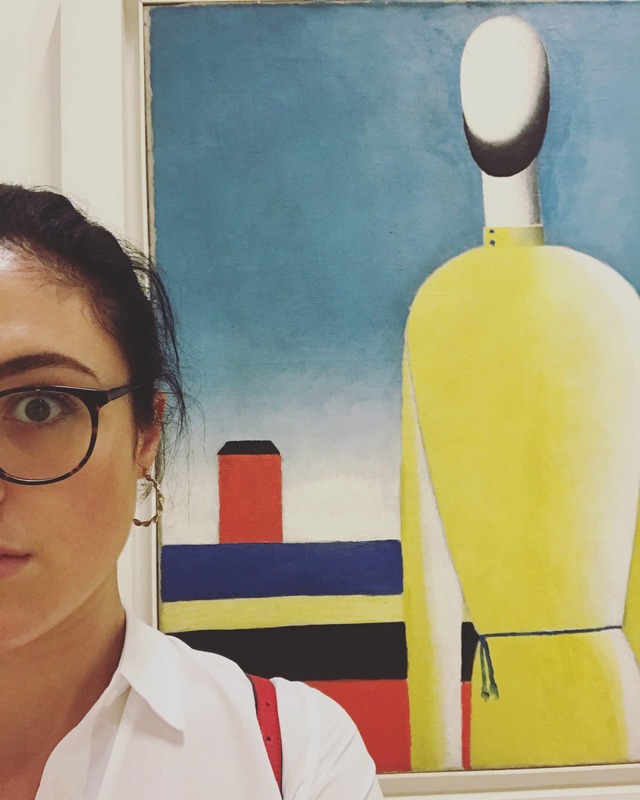 Sophia Fisher in front of a Malevich painting at the Russian Museum. It cannot be, then, that Russian art is not beautiful, complex, or intellectual enough to make the syllabi of western classrooms. So, I believe that the exclusion of Russian art from western programs is the casualty of pride, failure to classify, and the product of political malaise. While American universities are not openly denying American students the opportunity to learn about Russian art and institutions, the lack of homeland coursework requires a mandatory pilgrimage by those who are interested. The Art and Museums in Russia program provided so much more beyond the kitsch of the Soviet posters displayed in Russian and Slavic culture classes at home. I have taken so many art history courses, but never once have I had the opportunity at the undergraduate level to take a course on museology. This new type of study, in combination with my first Russian art course, has immensely enriched my ideas of what a museum space is and what a museum space can be. I’m very interested in design, and am considering a second undergraduate degree in a design-related field, so for me this was a fantastic opportunity to see a variety of creative display spaces. I found the most impactful museum concept to be the Russian house-museum. These seem to be incredibly popular in Saint Petersburg in particular. These spaces seem very novel to my American eyes, as I am so accustomed to the sterile contemporary gallery spaces of New York and Chicago. The experience of walking through the home of an artist is irreplicable. No museum or gallery can fully compensate for what a house-museum has to offer. 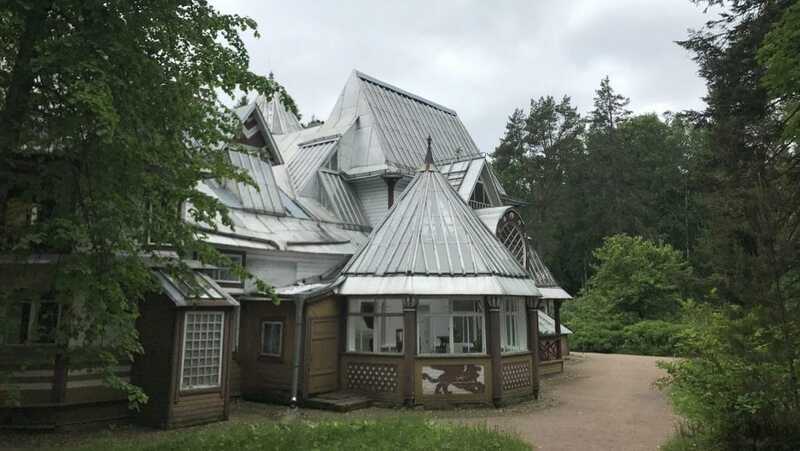 As I walked through the countryside home of Ilya Repin, for example, the artifacts of his life created a tactile narrative which interacted with the works displayed the house and my memory of his works in the galleries of Saint Petersburg. It was very easy to associate the concepts expressed in his paintings with the textiles, objects, and natural world around Penaty. The feel of the outdoors, the grey sky, verdant forest and moody nearby Finnish Gulf, surely all contributed to the emotive, deeply psychological, and sometimes fantastical work of Repin. Another concept inaccessible at home but heavily emphasized within the Art and Museums in Russia program is the conservation and preservation of materials. I have always been incredibly interested in textiles, both in clothing and furniture design. I’ve never been too interested in being a fashion designer, but always in textile production, fabric materials science, and pattern design. Textile restoration would be an ideal career for me, and one that I am seriously considering. As we toured the State Hermitage Storage Facility, I had the opportunity to inquire about all sorts of items of clothing and furniture that are kept there. I learned a great deal about how the silks of palace walls and sofas are specially kept, as to prevent fading from light and damage from dust and the often humid atmosphere of Saint Petersburg’s marshy landscape. The science and techniques which have kept Russia’s textile collections strong and healthy really cannot be expressed in a textbook or on a screen. 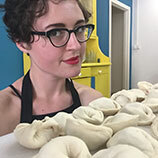 For a student like me, mostly interested in a career in the care of textiles and domestic objects, the Art and Museums in Russia program has provided an invaluable opportunity to experience the curatorial and preservation processes from start to finish. I have seen objects as they are repaired in the Storage Center, and objects as displayed in the Hermitage museum itself. The Russo-centric, start-to-finish explanatory scheme of this program is incomparable foundational educational knowledge unavailable anywhere in the United States. 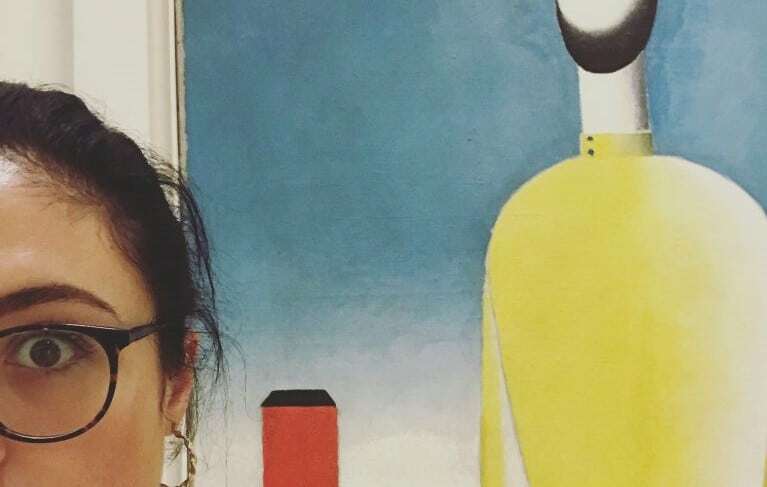 As I prepare for specification and graduate school, I feel very confident that the opportunities I have had through the Art and Museums program will prove very useful in my upcoming years of study and work.